Getting away from the crowds in Amsterdam was never as rewarding as it is now. Whenever I go to Amsterdam with friends visiting from abroad, I take them to Amsterdam Noord: the north of Amsterdam. This area of the city is not yet overrun by tourists and is authentic and edgy at the same time. 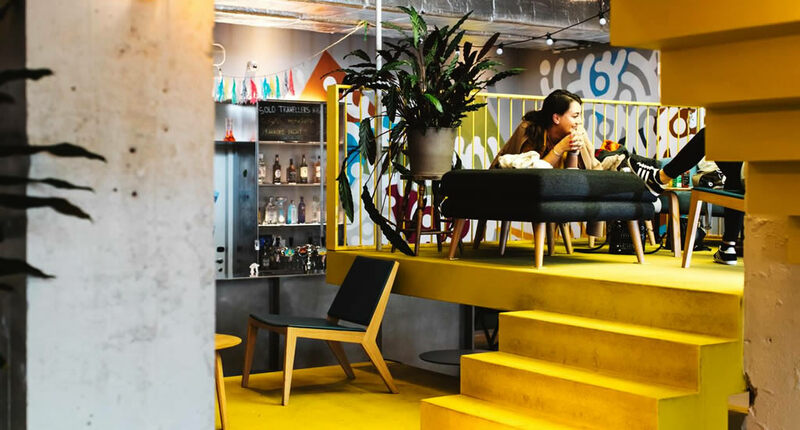 Have lunch in a sea-container restaurant, sit on a swing set on top of a skyscraper whilst taking in the gorgeous view over Amsterdam or cycle along beautiful traditional houses. Convinced? I bet you are, so please read on and find out how to go off the beaten track in Amsterdam. 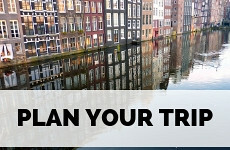 Planning your trip to Amsterdam? Check out my complete Amsterdam guide! Amsterdam Noord (or Amsterdam North, if you like) was once quite separated from the rest of the city, by the IJ river. The Buiksloot neighbourhood was considered a village instead of part of Amsterdam and the rest of north was used for heavy industry and not really interesting for visitors. But that’s really no longer the case. Ever since the free (!) ferries over the IJ river were introduced, connecting Noord to the rest of the city, the area rapidly became more popular with locals choosing the area to live over the more expensive centre and the south of town. 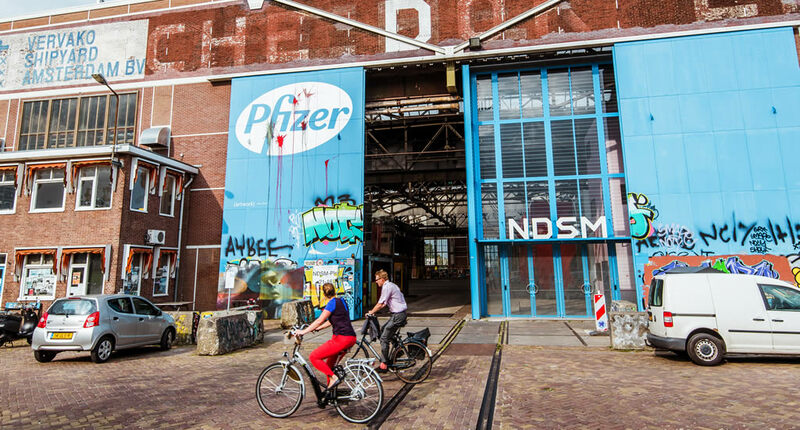 When industry pulled out of the city and old industrial areas were redeveloped, Noord quickly became a real hotspot. At the back of Amsterdam central station, hop on the free ferry to Buiksloterdijk. 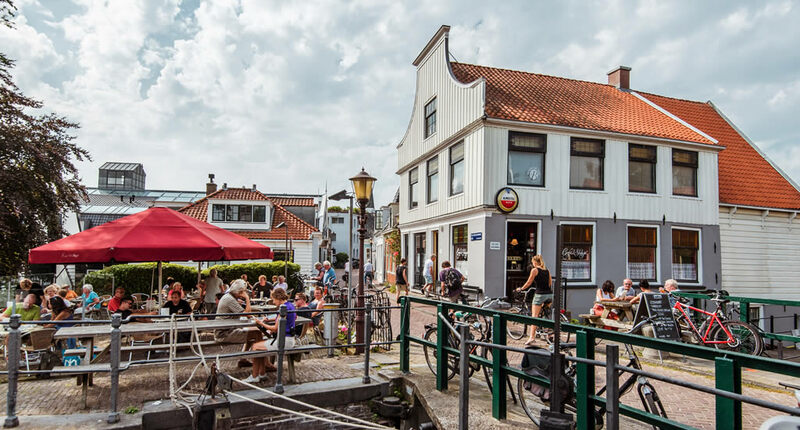 Take your rental bike along, as you definitely want to visit the old Buikersloot neighbourhood, one of the most authentic and undiscovered sides of Amsterdam. Once upon a time (seriously, back in the 1300’sor something) farmers would roam these shallow lands until the land was completely reclaimed and became part of Amsterdam. Since it was always a little separated from the city, by the river, it always kept a bit of a village feel and this is still very noticeable along the Buiksloterdijk. 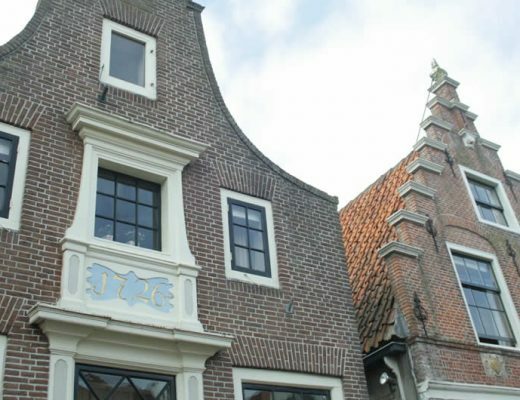 The cute half-timbered houses with Dutch gables are simply adorable. No no no, I am (absolutely!) not talking about getting high. 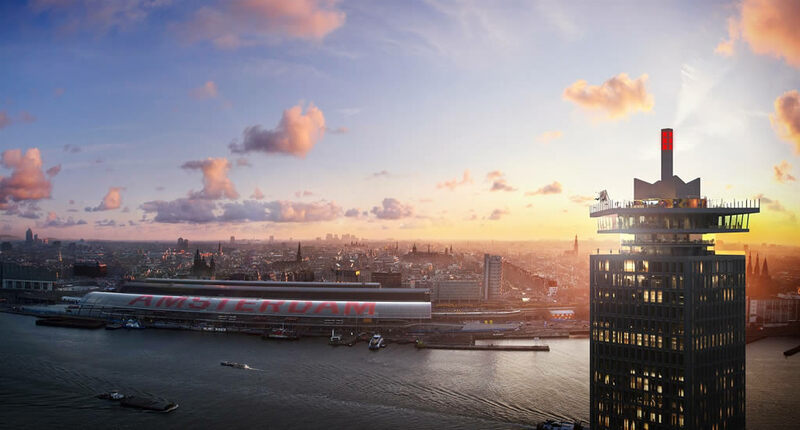 I am talking about taking the ferry to Buiksloterweg and visiting the observation platform on top of the A’DAM building, Amsterdam Lookout is the new place to visit in Amsterdam. 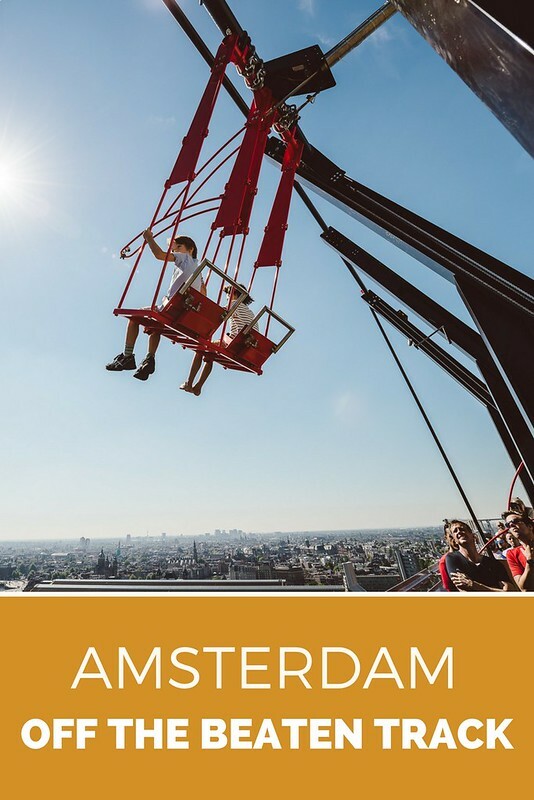 Take the lift to the top floor and sit on the swingset and enjoy the absolutely excellent view over Amsterdam. If you’re less of a daredevil (and I wouldn’t blame you… eek! ), just order a cocktail or two at the bar. If you rather stay at sea level, next to the A’DAM Building is EYE, one of my favourite lunch and drinks spots in Amsterdam. You’ll immediately see the cutting edge, white and glistening building when you’re on the ferry. 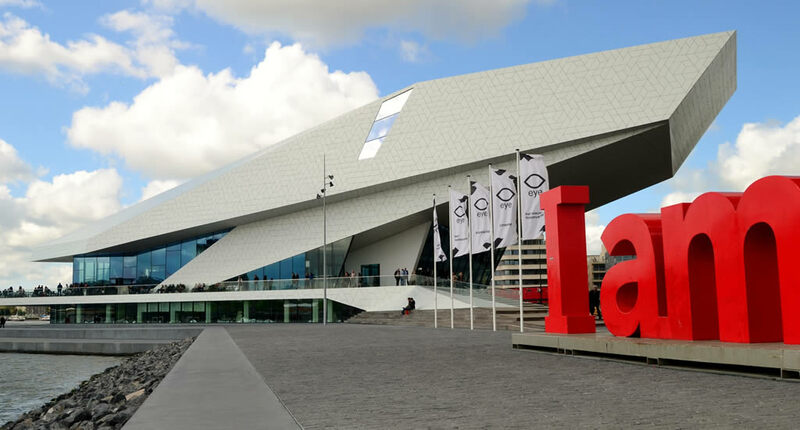 Set on the banks of the IJ river EYE is actually a large cinema, showing mostly arthouse movies and often hosts interesting exhibitions. But I think the nicely designed restaurant and outdoor seating with Amsterdam views are the biggest plus of this place. 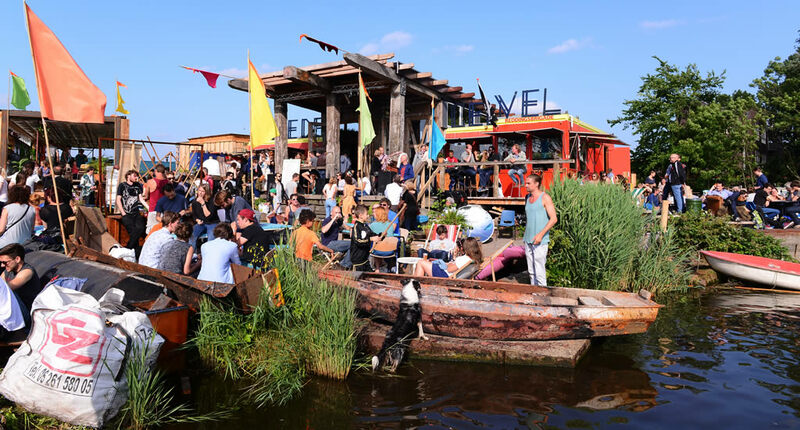 Just after disembarking the ferry, you’ll stumble onto Tolhuistuin, the former canteen of Shell is now a fantastic cultural centre, often hosting great gigs and the restaurant and outdoor seating are excellent. Once you get off the ferry to NDSM wharf the rusty sheds and unruly landscape of warehouses don’t exactly scream: visit me. However, it’s this raw and creative beauty that makes you think you’re in Berlin or Brooklyn, and not in the cosy Dutch capital. Between 1894 and 1979 the island was used by the ‘Nederlandse Dok en Scheepsbouw Maatschappij’ (hence NDSM) using it purely for industrial purposes. But now, no more. The island is the place to see cutting-edge street art, visit creative shops and go to funky festivals. Have lunch or dinner at least once at Pllek, my favourite restaurant in Amsterdam, set in old sea containers, serving amazing food, made with seasonal and local ingredients only. Oh, and the cocktails and list of local beers aren’t bad either. I love where my work leads me sometimes! I ended up at café De Ceuvel for a book launch, on a beautiful summer day. When I got off the bus, I found myself surrounded by garages and shack which made me think: am I in the right place, at all? But once I arrived at De Ceuvel at the edge of what seemed to be a small lake I was hooked right away. De Ceuvel is the centre of a small alternative community that addresses pollution in Amsterdam and likes to live clean and green. Well, that’s fine with me. The café, at the water’s edge, is colourful and romantic (just as most of it’s daily visitors) and the view over the water is very (very!) relaxing. Going to the beach, in Amsterdam? Oh sure! When you venture outside the city centre to Amsterdam Noord, you can absolutely find some places to dig your feet into the sand. First of all, there’s the beach garden of Pllek, my favourite restaurant in Amsterdam. The atmosphere is really relaxed and you’re treated to some great views of the city. Blijburg is another excellent city beach, where some great summer parties are hosted in summer. Staying in a great hotel in this lovely area of Amsterdam is definitely not a bad thing. You’ll be away from the big crowds, but as you have read in this article, you are still surrounded by some great bars, restaurants and nightlife. 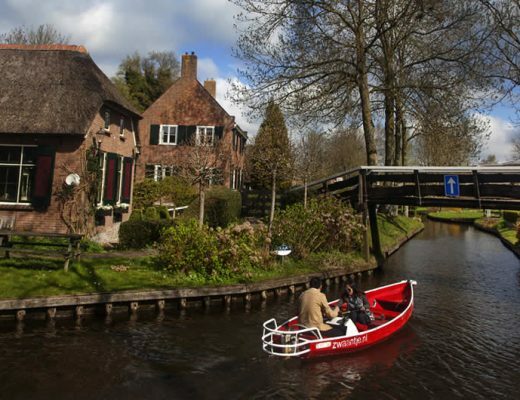 Plus, once you’re on the ferry, the centre of Amsterdam is only 15 minutes away. Only 15 minutes from the centre of the city and still such a lovely, buzzing, creative place. 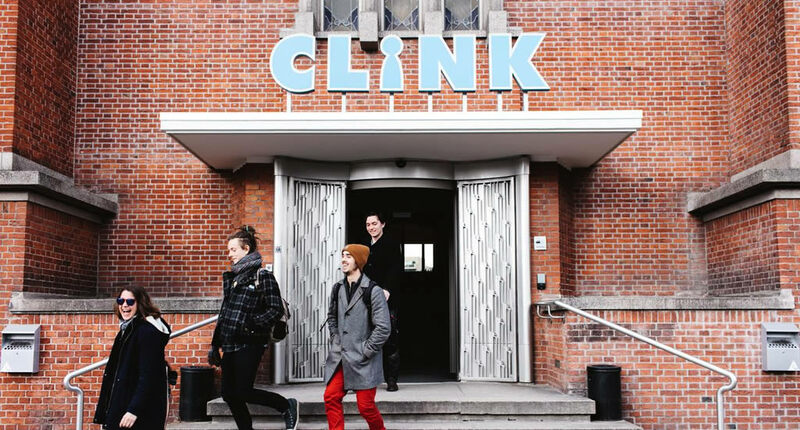 ClinkNOORD is officially a hostel but has basic and nice double rooms available too. The café and lounge are relaxed and perfect if you’d like an evening in. i Hotel is near the free ferry to central Amsterdam and a real gem. With nice, light rooms and a cosy café for breakfast and a good cup of coffee. 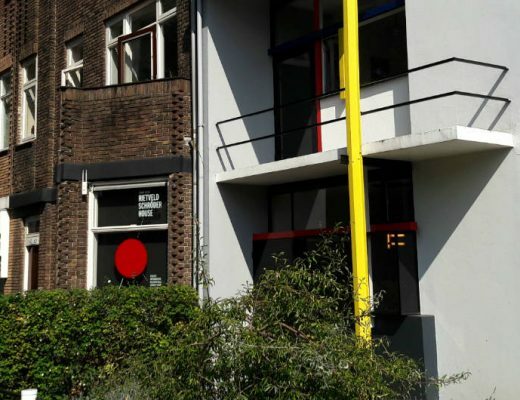 Talk about a great location: next to next hotspot on the block Amsterdam Lookout. The large rooms are a quirky mix of Persian rugs, vintage furniture and bright bedding. 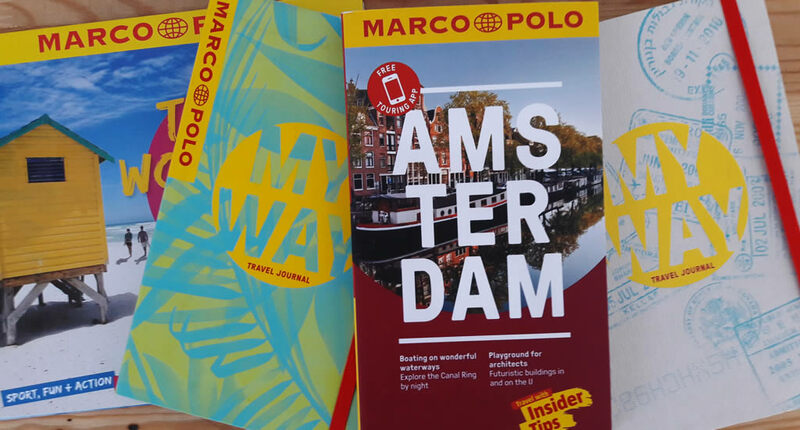 Win a Marco Polo Amsterdam goodie bag! Hurray! I am hosting my very first Give Away, I am so excited and I hope you are too. Massive thanks to the lovely peeps over at Marco Polo who are allowing me to give away some excellent goodies! 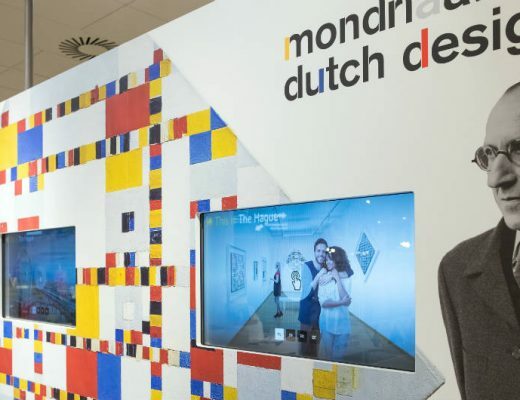 Since most of you visiting The Netherlands will start in Amsterdam (before hopefully seeing some more of the country), you can win…. The new Amsterdam Guide and a travel journal. I really like the Amsterdam guide, as it not only features the highlights of Amsterdam, but also some nice insider hotspots. 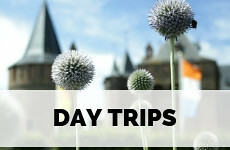 I especially like the 4 Discover Tours which allow you to explore Amsterdam off the beaten track. Consolation prize: a Marco Polo travel journal (incl. stickers and nifty planners). How can you win? Easy! Leave a comment telling me which off the beaten track Amsterdam hotspots you’d like to visit. 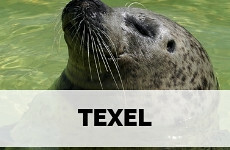 You can choose one from this article of course, or use my Alternative guide Amsterdam as your inspiration. Leave an extra comment to have an extra chance at a prize when you have followed Your Dutch Guide on Facebook, Twitter, Bloglovin and/or Pinterest. This Give Away is open to participants worldwide! I will e-mail the winners on February 24th. Good luck! I absolutely love old warehouse and industrial districts that have been repurposed as new art galleries, eateries, shopping centres, bookstores, and the like. They usually have a creative and modern vibe with lots of unique touches and open air seating. So North Amersterdam looks like it fits this type of urban transition. Now I know much more about it from your informative post. I think I would like staying in that i hotel. I have a feeling I am going to like Amsterdam Noord. I’m making plans to come to Amsterdam this year and I’ll make sure to visit this area too. Oh, you should. It’s great to escape the crowds for a bit. It looks like a great area! I love that swingset – would be great to try it out. The buildings in Buikersloot look cute too. OMGosh!! Why have I never heard of this part of Amsterdam!!! It looks and sounds amazing and now I’m going to have to plan a visit!!! What a great post! All of these things seem so fun and funky. 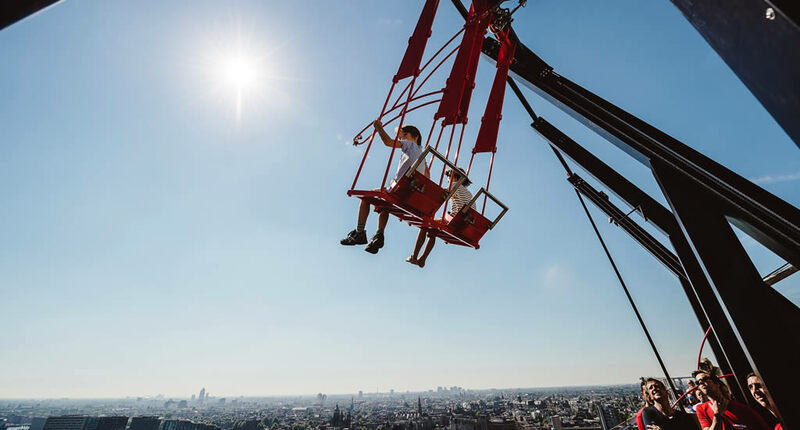 I would especially like to swing from the Amsterdam Lookout – what a fantastic view. That swing looks like SO much fun! I’d definitely do that, and I definitely wouldn’t have a drink first. Eeeek. I’d also be keen to visit Tolhuistuin and NDSM, they sound like super cool culture type places. One day I’ll make it to Amsterdam I’m sure! Some very nice places there! This seems like more my scene. The first (and only) time I went to Amsterdam, I didn’t really enjoy it. I think I need to give it another try and spend sometime outside the city center though. Thanks for sharing all these ideas! It can be quite overwhelming, can’t it? 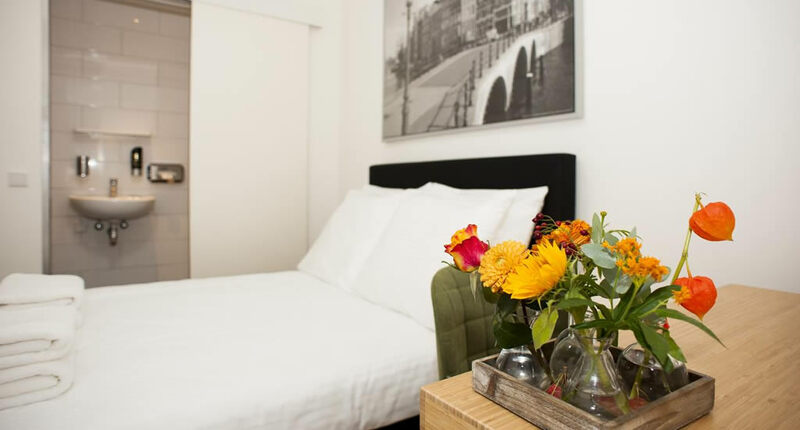 I hope it’s a comfort for you to know that you can have a relaxing time in Amsterdam away from the masses. Ooh love this detailed guide – and a giveaway of course! I’m actually doing some work with an Amsterdam hotel right now and I seriously want to go back! I have to say I would love to visit the Amsterdam Lookout. I love good views!! This area sounds amazing – reminded me a little of the Kalamaja district in Tallinn. We were talking about a trip to Amsterdam recently, I want to go even more now! heading there next week. Thanks for all the great tips. This is the second time recently that Amsterdam Noord has come across my radar. I love the vibe here, especially in warmer months! The idea that you could stay in a fun area away from crowds and still easily get into city sounds perfect to me! Oh wow, in my three visits I haven’t once made it to Noord so clearly I am missing out! You are!! I hope you get to see it next time. It’ such a lovely area of Amsterdam. I always recommend friends and family who come to visit the Netherlands to check it out to see the ‘real’ Amsterdam away from the major tourist traps downtown. I totally agree with you Jules! 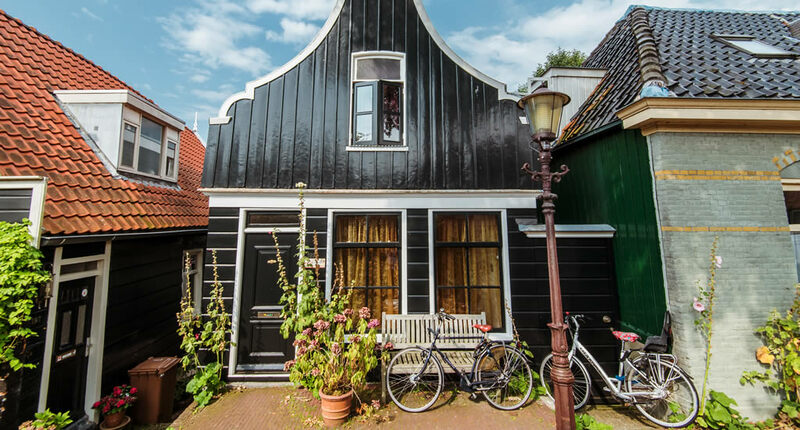 I would love to explore this part of Amsterdam – it sounds delightful and I’m always looking to go off the beaten track though. I’m not sure if I’d dare to do on that swing though! I like your humor, and yes, the swings appears to offer a panoramic view; however, it might not be for me. 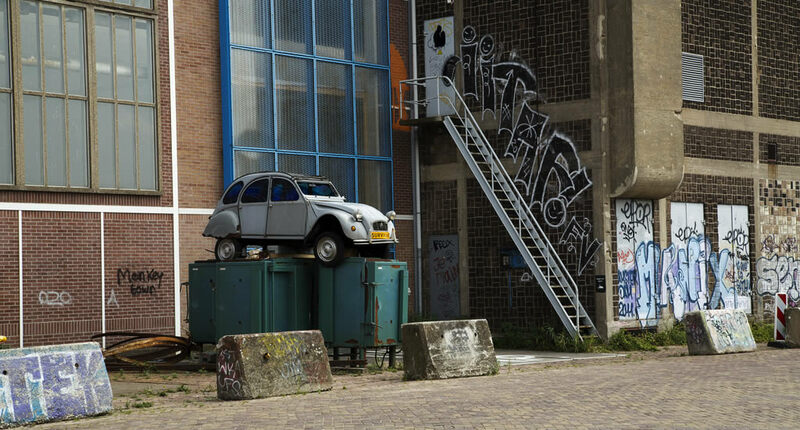 Exploring Amsterdam Noord would be so much fun. I have been to the southern part but the northern section looks so less hectic. Buiksloterdijk would be fun to ride a bike, plus a visit to the island NDSM where they want to live clean and green. I will definitely add this to my travel list. Oh dear, I’m not original in my reply, but I’d LOVE to visit that swing! I love being anywhere up high, so that looks amaaaazing! I am also a big fan of street art, so the whole area looks fantastic to me. Merci for sharing! 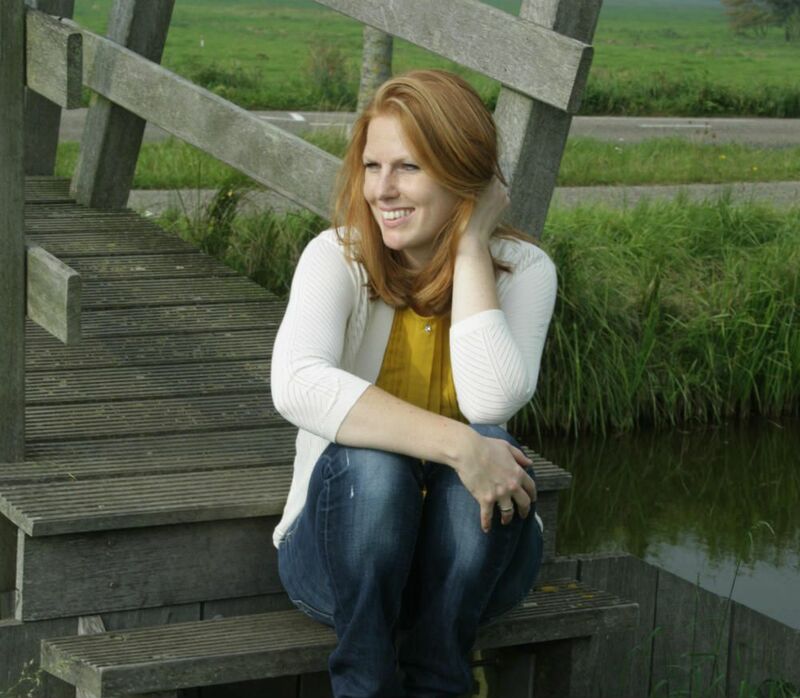 My husband works for a Dutch company and I’m waiting until I’ll be able to go visit him. I will definitely keep your suggestions in mind!!! Amsterdam Nord seems very different that the typical tourist photos we see of Amsterdam. It seems like it would be fun to explore before reflecting on our day at Cafe de Ceuvel. We love finding awesome places like that, so we’ll make a note to find this place. Amsterdam is high on my list of places I want to visit. It seems so beautiful! I think I’d want to rent a bike and just get lost in the streets of Amsterdam or drive out of the city to find new gems. Lots of new tips on this post. 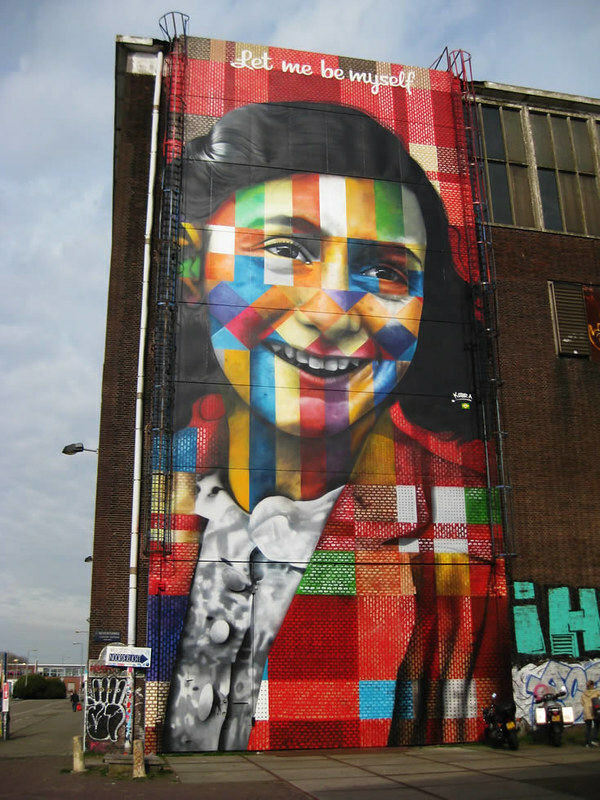 I like the mural of Anne Frank and obviously the canals. Hope to make it there by next year! I am glad this is an off-the-beaten-track part of Amsterdam. To be honest, this is the firs time I heard about the area. But like I mentioned, it is good that places like this exist. It is even cooler that you take visitors there. Sometimes, certain places are popular (and well known) but locals prefer other (happens to me all the time in Los Angeles). Honestly, I think I would rather visit this area, then the main part of Amsterdam. I just love the vibe I’m feeling through your pictures. I think I’d probably give that swing a try. Street art, cafes and a ferry ride are my jam. I rarely venture into the city centre of Amsterdam, unless I really have to (because of a work appointment or something). There are many off the beaten track parts of town, luckily, so it’s still okay to visit! 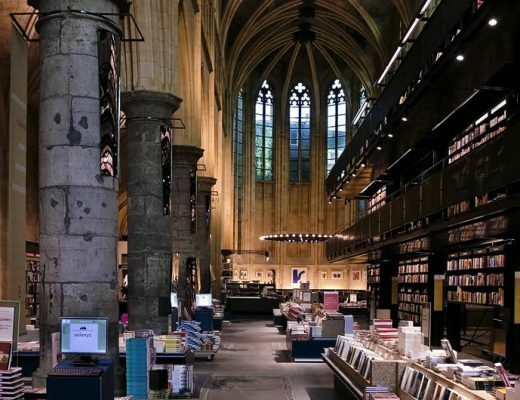 I’m so glad I read your post…we’re headed to Amsterdam this year and we love going to uncommon places. Saving this for later when we start our trip plans. Thank you! Love this post! Your photos are beautiful and I would love to follow this itinerary step by step! Cafe de Ceuvel looks so inviting and relaxing. 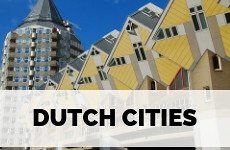 Definitely saving this post for my next trip to the Netherlands! Your take on Amsterdam makes it look like so much fun! I’d definitely check out the swing and those cute houses, the event space and bicycle around. Just need to get there for a good long visit. That looks amazing especially the Swingset and this has really made me want to take a trip to Amsterdam. I didn’t even know that there was a beach close by Amsterdam! That has to be so much fun, along with that roller coaster! This is such a great introduction- I heard how cool this area was and a bit about the street art but had no idea there was quite as much to discover. Ahh I wish I had known about Amsterdam Noord when I was in the country a few years ago? I love that the ferries to get there are now free. 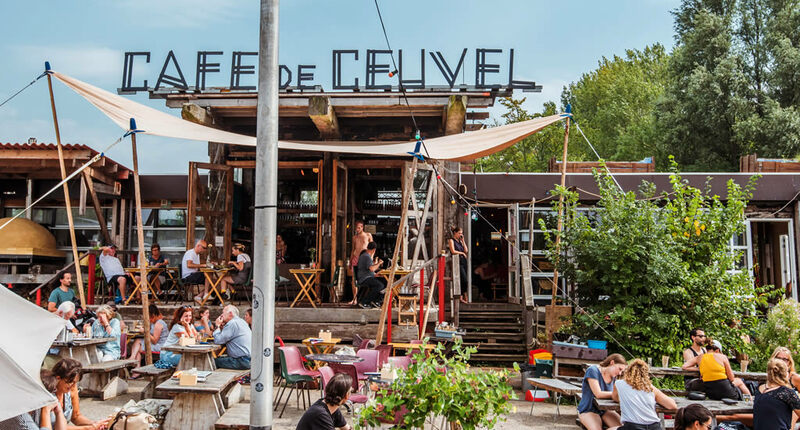 I’d love to kick back and relax at café De Ceuvel too! I didn’t do any of those things when I was in Amsterdam. That swing looks like heaps of fun, I sooo want to go back to try it now! This is a great post to let people know to travel away from central Amsterdam. I need to go back and spend more time in your area! I would for sure love to be swinging high above ground! That looks SO fun! 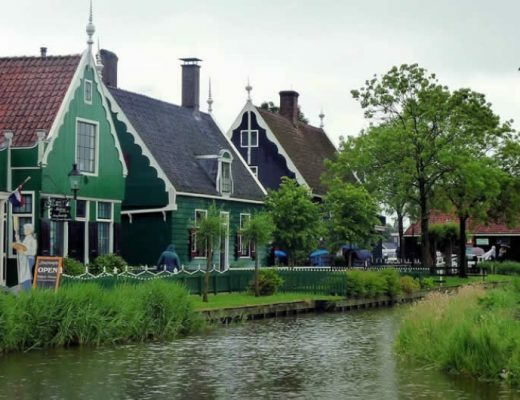 Your photos are so beautiful… I really want to visit Amsterdam and I would definitely head to the north part now. I especially want to go on the swing! Thank you for a very insightful travel through your eyes. I am going to be for first ever time in Amsterdam 4-8 Dec 2018. Do NOORD cater for winter also. I am an contemporary artist. Anything else?? ?